A wet and cold morning in Wexford town today, but there was a great crowd for the race. It was interesting to see the chap Garrett Doherty, from Donegal, runthe whole Half Marathon backwards with the help of two guides, I must say he was flying from the start. The crowd was really bunched at the start so it seemed to take a while to get started. The rain, when it came was cold, but really once I was in the swing of things I didn’t notice so much. There was only one long hill to this course so overall it was flat enough and in the end the clock had me at 0:44:12 and from the tag 0:44:05. That was just fantastic a personnal best I’m over the moon ! I placed 27th out of 361 which I’m also pretty happy with. 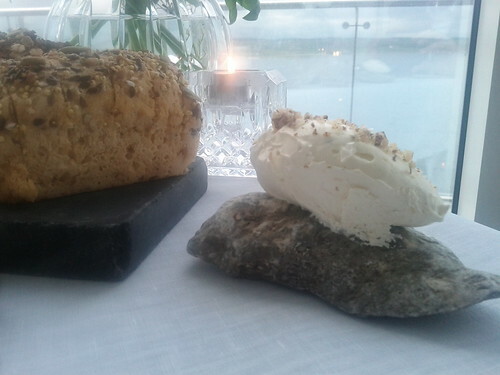 Butter served on a stone, a photo by miguelpdl on Flickr.